Do you have a balloon popping strategy? Is there a method to your madness when popping balloons at Sideshow You? It’s a game of chance, with entirely random odds, but that doesn’t stop people from believing they’ve found the trick to winning big each time. Some rounds you may only get a few tickets, other times you might get more, and on that very rare occasion you might even get some donuts. It’s enough to keep players coming back, which is fine since it is a game that has no upfront costs. All you need to do is come back every eight hours for another chance to win big. For me, if three balloons of the same color appear, I feel inclined to pop those three. Do you have your own personal balloon popping preference? Share you strategies in the comments. I have received so many friend requests that I have once again met the one-hundred in-game neighbor limit. Sorry to all of those who sent a friend request that I could not accept because of this. 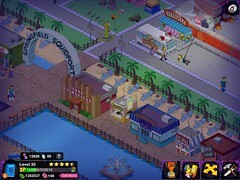 Even though I can no longer accept friend requests, there are plenty of others who could use a few more places to trick-or-treat once the Treehouse of Horror event begins. If you are one of my neighors, you may see your town featured in future “What have you done with…” posts. If you’re not one of my neighbors, just submit your photos to the Flickr photo pool. It’s always nice to see new photos added by such creative players.